In this book, Maulana Muhammad Ali tackles the topical subjectsof Islam’s liberal view of other religions, its faith in all Prophets (peace be upon them), freedom in Religion, the basis of Jihad (Holy War), the bond of friendship with non-Muslims, and the sensitive issue of apostasy. Muhammad is the last of the Prophets. There is a very general and very deep-rooted misconception that the Quran preaches intolerance, and that Muhammad preached his faith with the sword in one hand and the Quran in the other. Misrepresentation could go no further. The basic principle of Islam, a faith in all the prophets of the world, is enough to give the lie to this allegation. The great and liberal mind that preached not only love and respect for the founders of the great religions of the world but much more than that, faith in them, could not shrink to the narrowness of intolerance for those very religions. Tolerance is not, in fact, the word that can sufficiently indicate the breadth of the attitude of Islam towards other religions. It preaches equal love for all, equal respect for all, and equal faith in all. “We have shown him the way, he may be thankful or unthankful” (76:3). “The Truth is from your Lord, so let him who wishes believe and let him who wishes disbelieve” (18:29). “Indeed there have come to you clear proofs from your Lord: whoever will therefore see, it is for the good of his own soul, and whoever will disbelieve, it shall be against himself” (6:105). “If you do good, you will do good for your own souls; and if you do evil, it shall be for them” (17:7). “And had there not been Allah’s repelling some people by others, there would have been pulled down cloisters and churches and synagogues and mosques in which God’s name is much remembered” (22:40). “And fight against them until there is no more persecution, and religion is only for Allah” (2:193). “And fight against them until there is no more persecution, and all religions should be for Allah” (8:39). “Permission to fight is given to those upon whom war is made because they are oppressed, and Allah is well able to assist them; those who have been expelled from their homes without a just cause except that they say, Our Lord is Allah” (22:39, 40). “And fight in the way of Allah against those who fight against you, and do not exceed the limits, for Allah loves not those who exceed the limits” (2:190). “But if they desist, then Allah is Forgiving, Merciful. And fight against them until there is no more persecution” (2:192, 193). “And if they incline to peace, do thou incline to it and trust in Allah; He is the Hearing, the Knowing. And if they intend to deceive thee, then surely Allah is sufficient for thee” (8:61, 62). The Prophet made treaties of peace with his enemies; one such treaty brought about the famous truce of Hudaibiyah, the terms of which were not only disadvantageous, but also humiliating to the Muslims. 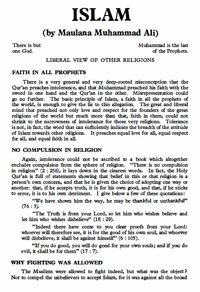 According to the terms of this treaty “if an unbeliever, being converted to Islam, went over to the Muslims, he was to be returned, but if a Muslim went over to the unbelievers, he was not to be given back to the Muslims.” This clause of the treaty cuts at the root of all allegations of the use of force by the Holy Prophet. It also shows the strong conviction of the Holy Prophet that neither would Muslims go back to unbelief, nor would the new converts to Islam be deterred from embracing Islam because the Prophet gave them no shelter. And these expectations proved true, for while not a single Muslim deserted Islam, a large number came over to Islam, and, being refused shelter at Madinah, formed a colony of their own in neutral territory. “Allah forbids you not respecting those who have not made war against you on account of your religion, and have not driven you forth from your homes, that you show them kindness and deal with them justly; for Allah loves the doers of justice. Allah forbids you respecting only those who made war upon you on account of your religion, and drove you forth from your homes and backed up others in your explusion that you should make friends with them, and whoever makes friends with them, these are the unjust” (60:8, 9). “And whosoever of you turns back from his religion, then he does while an unbeliever — these it is whose deeds go for nothing in this world and the Hereafter” (2:217). “O you who believe, should one of you turn back from his religion, then Allah will bring a people whom He shall love and they too shall love Him” (5:54). “Those who disbelieve after their believing, then increase in disbelief, their repentance shall not be accepted, and these are they that go astray” (3:89). On the other hand, the Quran speaks of a plan of the Jews to adopt Islam first and then desert it, thus creating the impression that Islam was not a religion worth having (3:71). Such a scheme could never have entered their heads while living at Madinah, where the Government was Muslim, if apostasy, according to the Quranic law, were punishable with death. The misconception seems to have arisen from the fact that people who, after becoming apostates, joined the enemy, were treated as enemies, or that, where an apostate took the life of a Muslim, he was put to death, not for changing his religion, but for committing murder. “Christ has redeemed us from the Curse of the Law, He being made a curse for us, for it is written, He that hangeth is an Accursed of God.” (Gal. 3 v. 13). Jesus was not killed, nor crucified, but so it was made to appear to the Jews, they did not really kill Him, Nay, God Exalted Him in his presence. God … shall send a messenger of salvation and his word shall be true insomuch that heaven and earth shall foil, but his faith shall never foil, MUHAMMAD is his blessed name. O God send us thy messenger, O Muhammed, come quickly for the salvation of the world. (Barnabas XCVII).